On a weekend of competing interests for local Shore historians and Douglassonians with overlapping events happening in Cambridge and Annapolis, reportedly seventy people of all ages and nationalities huddled into the second-floor large meeting room of the Denton Branch Library to hear the debut presentation of “Lost History of Frederick Douglass in Caroline County” by John Muller, author Frederick Douglass in Washington, D.C.: The Lion of Anacostia. 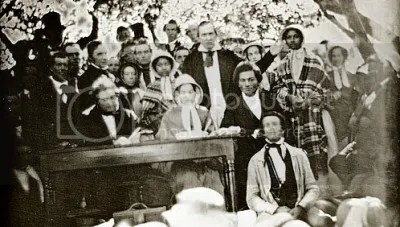 With authorization from Old Anacostia Douglassonians and support from families with ancestral origins in Caroline County and the Eastern Shore before American Independence, the presentation provided an abbreviated introduction into the interconnectedness of the families of Anna Murray, Bishop Alexander Wayman, Frederick (Bailey) Douglass and Perry (Bailey) Downs. Chronicled in contemporary newspapers in Washington, D.C., Baltimore, Delaware and the Eastern Shore, details of a previously unknown visit Dr. Douglass made to Caroline County were briefly shared. Continuing to uplift the lost history of Frederick Douglass in Maryland with support of public libraries across the state, Muller will present “Lost History of Frederick Douglass in Western Maryland,” Tuesday, February 12 at the Fletcher Branch of the Washington County Library in downtown Hagerstown. On the evening of Thursday, February 28, Muller, along with Dr. Ida E. Jones, author and Morgan State University Archivist, will present “Lost History of Frederick (Bailey) Douglass in Baltimore” at the main branch of the Enoch Pratt Library in downtown Baltimore City. DENTON — John Muller, author of Frederick Douglass in Washington, D.C.: The Lion of Anacostia, along with Denton Town Councilwoman Doncella Wilson will be discussing a previous unknown visit Douglass made to Denton. The talk will be held at 1:30 p.m. Feb. 9 at the Caroline County Central Library in Denton. Muller is known for producing a number of works, including Mark Twain in Washington, D.C.: The Adventures of a Capital Correspondent, and is currently working on Lost History: Frederick Douglass and Maryland’s Eastern Shore. Muller will detail a visit made by Douglass, where he arrived by train before departing by boat to return to Washington, D.C., in late October 1883. Muller also said his research found that Douglass’ grandmother was well known in Denton for selling fishing nets. Muller said his series of talks, speaking last September about a previously undocumented visit by Douglass to Cambridge, are a way to bring lost history to residents. Muller said documenting Douglass’ visits to the Eastern Shore, along with what he does during those visits, help researchers make inferences about his personality. Muller said one inference he has made, through researching Douglass’ speeches on the Eastern Shore, was that he was highly politically motivated and vocal within the Republican party. Muller said after the Civil War, Douglass knew many influential state politicians running for office. Muller said highlighting the history of Douglass in select counties around the Eastern Shore is part of finding lost history about his life. Muller said the bicentennial celebration of Douglass’ life has motivated him to find more history about his life. For more information on upcoming events, presentations, walking tours and newly discovered research, visit https://thelionofanacostia.wordpress.com or www.facebook.com/LionOfAnacostia. On Feb. 28, Muller will present “The Lost History of Frederick (Bailey) Douglass in Baltimore,” at the Enoch Pratt Central Library with Dr. Ida E. Jones, Morgan State University’s archivist.